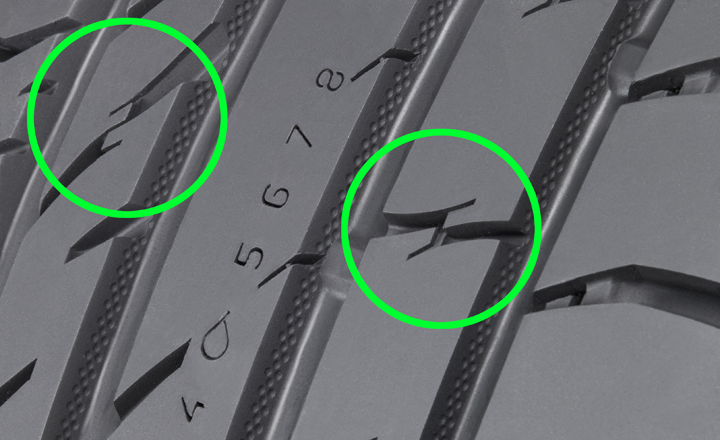 The Cross-block sipes on the ribs of the tyre's centre area work in two ways. Near the outer shoulder, the Cross-block sipes work together with the stiffer rib, providing stability for all conditions. The more heavily articulated Cross-block sipe on the rib next to the inner shoulder ensures soft road contact, reducing rolling resistance and noise level. The angle and groove volume of the Cross-block sipe that is diagonal to the rib have been optimised. On wet roads, the Cross-block sipe is also doubly effective at preventing aquaplaning. On road contact, it stores water and accelerates the flow of water into the main grooves.